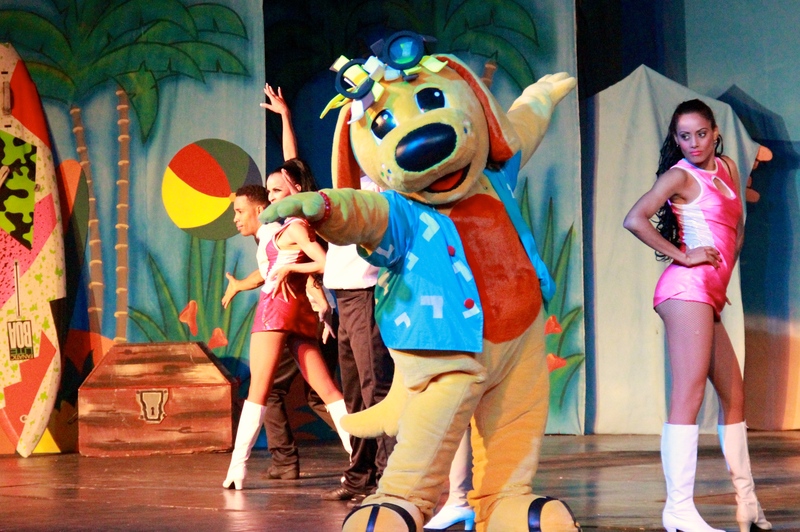 When the rockin’ characters from the Raggs TV series take the stage at the four Grand Palladium Resorts in the Caribbean and Mexico, the pups and their back-up dancers represent a blend of techniques, styles and experience from around the world including Mexico, Australia, the UK, Italy, U.S.A., and many countries in Latin America and the Caribbean. 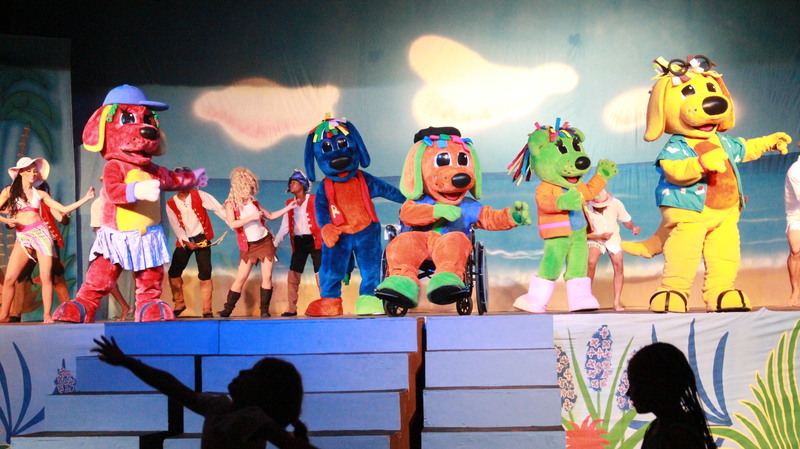 As part of the Grand Palladium Resorts “Play at Palladium with Raggs” program, an exclusive license with the parent company Blue Socks Media in the U.S.A., Raggs live shows and events are an integral part of daily activities at the resorts. While all of the original Grand Palladium shows, including the Raggs shows, are tightly scripted and choreographed, each resort showcases its dancers special talents and unique styles. In Mexico, acrobatics are important, while in Punta Cana the emphasis is on precise synchronization. However, in Jamaica, expect six pack abs with extreme athletic improvisation. 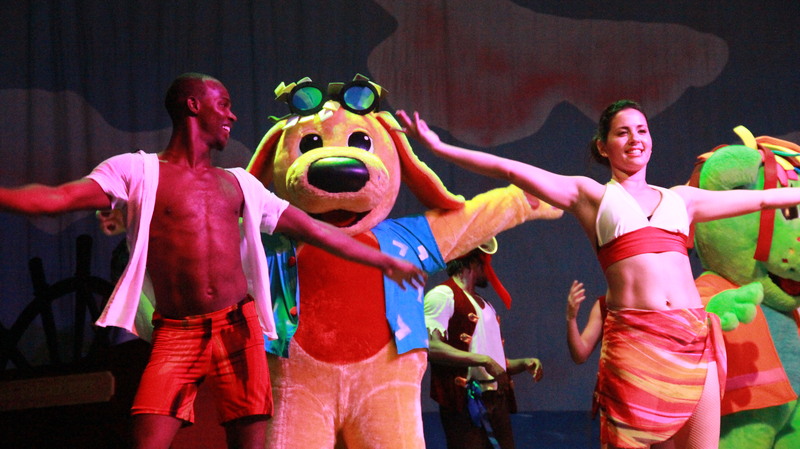 Typically, Grand Palladium’s large productions, such as “Raggs Pirate Show,” a 50-minute, 10-act show, are presented on a large stage at each resort and utilize the full staff of approximately 20 dancers, five characters and an emcee. 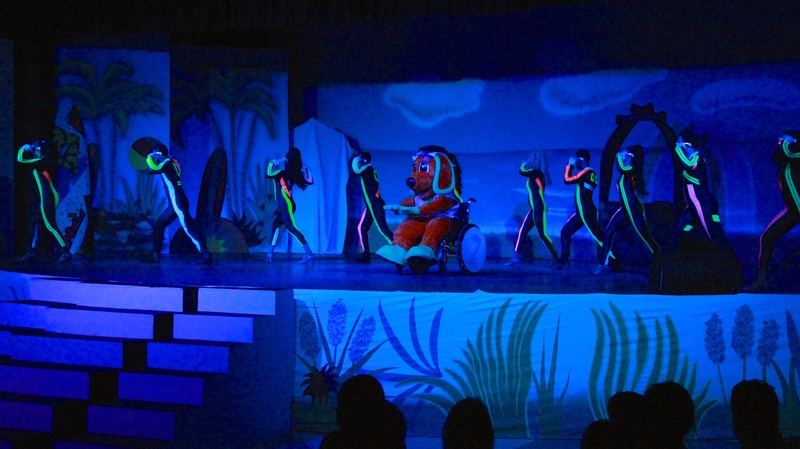 Other shows or events, like Pido’s Surf Party, are also complemented with dancers, including the Raggs characters, which must perform the choreography in colorful fur costumes. At Grand Palladium, Punta Cana, the dancers are usually from the Dominican Republic or Cuba. “You’ll notice that the native Dominican is several inches taller than average,” according to Patra Betemit, the choreographer who originally trained in ballet at Belles Artes y cultos in Santo Domingo. “Our Dominican troupe is very long and lean, giving their dancing style a graceful look, ” he added. At the Grand Palladium, Montego Bay, Jamaica, it is important to preserve native styles and traditions. Javier Alcantara , the resort’s Jamaican choreographer, who danced for 13 years at the famous Tropicana in Havana, Cuba, and who now oversees a troupe that is primarily Jamaican and Cuban. “Dancing is cultural here in Jamaica so many of the dancers started street dancing at an early age,” Javier explained. “We’re often asked by dancers, sometimes who are in the audience as guests, how to apply to dance at the Grand Palladium, “ Ricardo Canales, Director of Entertainment for the Grand Palladium Resorts, said. Applications can be made through human resources at the Grand Palladium website, PalladiumHotelGroup.com, or by contacting each resort independently. “Once selected, there is a trial period before we can offer a contract or assist with visa and relocation if needed, but it a great career for people who love to dance and make people happy.” Canales added. There are currently 14 Grand Palladium Resort & Spas located in Mexico (Riviera Nayarit and Riviera Maya), the Dominican Republic (Punta Cana), Jamaica (Montego Bay), Spain (Ibiza) and Brazil (Bahia). Whether guests are whale watching in Riviera Nayarit or snorkeling in the shores of Punta Cana, Palladium Hotels & Resorts ensures a memorable vacation experience for all. Each of the properties offers a wide variety of restaurants, spa services, recreational facilities and age-specific kids clubs. Palladium Hotels & Resorts is owned and managed by the Palladium Hotel Group. For more information, please visit www.palladiumhotelgroup.com or follow us on Facebook and Twitter. Palladium Hotel Group is a Spanish hotel chain with over forty years of experience. The chain has 50 hotels in six countries: Spain, Mexico, Dominican Republic, Jamaica, Italy and Brazil and operates five brands: The Royal Suites by Palladium, Palladium Hotels & Resorts, Fiesta Hotels & Resorts, Ushuaïa Ibiza Beach Hotel, Ayre Hoteles, and four special products: Hard Rock Hotel Ibiza, Only YOU Hotel & Lounge Madrid, Agroturismo Sa Talaia and Mallorca Rocks Hotel. The Palladium Hotel Group is characterized by its philosophy of offering guests a high standard of quality facilities and services in each of its hotels and resorts as well as excellent value. Palladium Hotel Group is a family owned company (Grupo Empresas Matutes) and based in Ibiza, Spain. 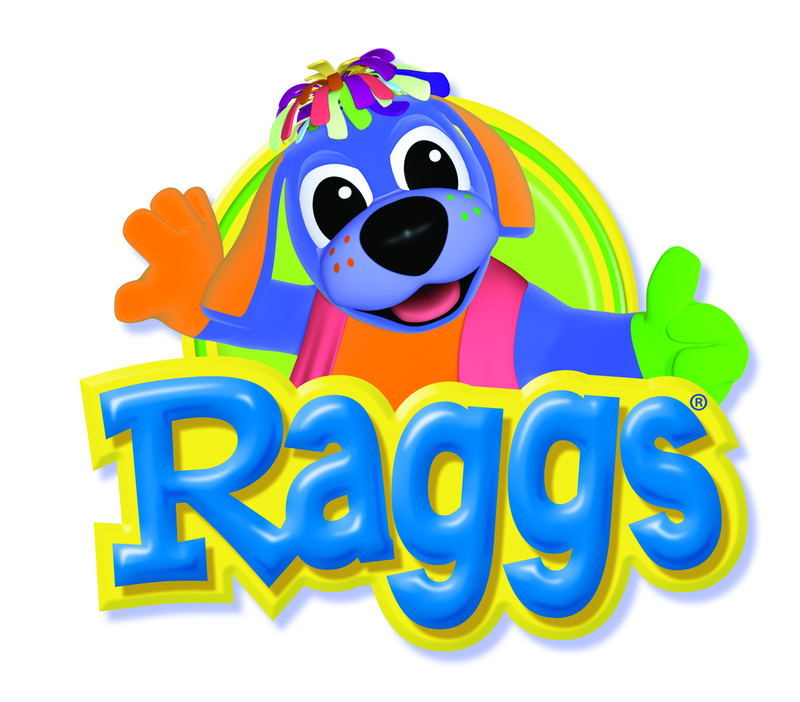 “Raggs” is an Emmy Award-winning, musical preschool television series about five colorful pups who learn life lessons in a cool clubhouse though the innovative mix of live action stories, music videos, concerts, cartoons and interviews with real kids. Originally produced in Sydney, Australia, with supplemental U.S. production, “Raggs” is available in Australian English, U.S. English and Spanish. “Raggs”’ expansive library includes 195 finished half hour episodes, 200 original songs, over 1,000 segments and the recent production (2015) of 20 classic songs with companion animated cartoons. The entertaining and educational series is based on the original characters created by Toni Steedman, a Charlotte, NC, advertising executive, for her then six‐year‐old daughter Alison. “Raggs” is an international brand including TV distribution, multi-platform digital distribution, CDs, DVDs, toys, books and touring. With over 4,000 live performances around the world, The Raggs Band’s live event experience has expanded to include a long-term partnership called “Play at Palladium with Raggs” with the Palladium Hotel Group at their resorts in Mexico and the Caribbean. “Raggs” and all rights are owned by Blue Socks Media LLC, Charlotte, NC. Blue Socks Media is a production and marketing company that owns the Emmy Award-winning "Raggs" children's TV series and executes worldwide management of the brand including media distribution, licensing, and partnerships.